The promotional A7 Sticky note is a very popular promotional gift, proven to be so much more than just note paper, particularly when you want your brand and message to stick. 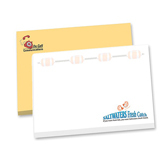 50 sheets of white sticky note paper with or without a wraparound laminated card cover. Promotional A7 Sticky notes are able to be printed up to 4 colours. Promotional sticky notes are available in a variety of sizes and shapes– You have A5, A6, A7, and A8 / rectangle, square, circle or even a bespoke design. You would know as a company what fits and suits your needs to promote your brand. Promotional sticky notes are great as free trade show giveaways as they are more than affordable, look great and put your branding message out there to anyone who sees them. They are a great corporate gift to send to clients as could bring you as the supplier more business as 79% of businesses are more likely to do business with companies they have received promotional gifts from. 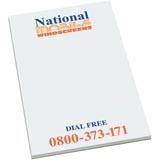 Promotional paper items are all very popular, the promotional paper range ranges from sticky note to calendars. 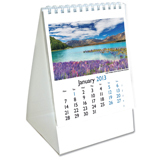 Promotional calendars are a great way to start the New Year With 13 bespoke inserts digitally printed 1 – 4 colours on each sheet, depending on what size promotional calendar you have all of the print areas are very generous which will enable your branding to make a great effect at a more than reasonable cost. Promotional Notebooks come in various sizes (A4, A5 and A6) – either hardback, Gloss laminated card or polypropylene cover each of these will be printed to cover and also to each individual page. Promotional note books are a great way to advertise your company, whether the company is just starting out or been around for decades, with an overly generous print area the branded area will not be missed.